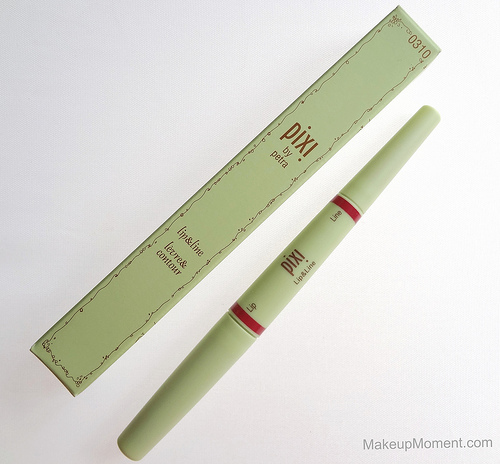 I received this Pixi Lip & Line in Peony Pretty ($18.00) in this month's Birchbox. When I saw this item inside my box, I couldn't have been more excited. I have never tried Pixi cosmetics but I do know that many rave about the products. I love lipsticks so this product couldn't have been a better pick for my first foray into Pixi. 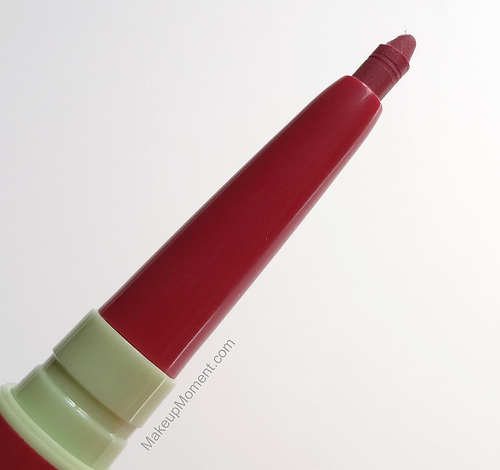 When I first saw the rosy pink coloring of the peony pretty liner and lipstick, I immediately thought about how great this particular shade would be, for the coming fall/winter months. I love my neutral lip colors as much as the next, but sometimes I favor a little bit of the drama and depth that deeper lip colors induce. To be honest, I hardly-if ever, use lip liners. I have never really gotten around to taking a particular interest in them, even though I know that they are superb to lengthen the wear of lipsticks. 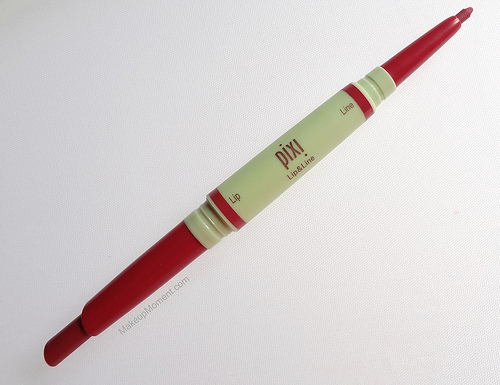 I was happy that this double-ended duo contained a liner because maybe this way, I can start familiarizing myself with them more and make lip liners part of my lip routine. The lip liner and lipstick are both the same color match, which I think is great because that way, the end result is much more seamless and natural looking. The consistency of the liner is a bit drier than I expected it to be. The liner tugged at the skin a little, and it doesn't really blend at the edges as well as I would like it to. The liner sets fast and once it's on, there's not really much room to work with it. The lipstick on the other hand, had a much more pleasant, creamier texture. It glided on the lips effortlessly and provided a rich burst of color. I thought the finish of the lipstick wold for sure be creamy since it glided on so easily, but I would say the finish is more semi-matte. The finish doesn't accentuate my dry spots, but it can enhance the flakes. I suggest prepping the lips before application, in order to obtain the best results. Both the liner and lipstick feel a tad heavy on my lips-definitely not lightweight. I can feel that my lips are coated with product. It also has a tacky feel on the lips, too. I wasn't impressed with the longevity of this product. The color fades on me within the 2 hour mark, and when it does, it leaves behind a stain, which is actually quite pretty. But after a few hours, the stain too fades and all I am left with is an unflattering line around my lips. Remarkably, once everything fades, my lips don't feel dry or stripped of. So, I can reapply with ease, if need be. Overall: I think Peony Pretty is a gorgeous color, and the fact that this is a travel-friendly product is a nice bonus. But the dryness of the liner, and the heavy feel of the liner and lipstick do put me off a bit. Not to mention, the lasting power isn't so great either. Since the liner had a dry texture, I was certain that it would act as a base and make the lipstick hang on for a good while. But alas, that wasn't the case. 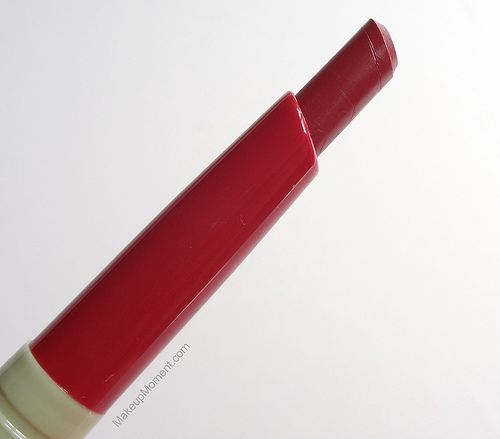 I will continue to use this product because quite frankly, it's a nice shade for the fall and, I guess I don't mind reapplying-just as long as it doesn't dry out my lips, which this doesn't do. What do you all think of Pixi's Lip & Line in Peony Pretty? Which are your favorite Pixi products? Disclaimer: I am not affiliated with any of the companies mentioned above. This item was included in my birchbox, that I purchased a subscription for. I got this product in my BirchBox too! I haven't really used it because I actually forgot about it lol...But I want to take it out and start using it, cause I was excited about it! had so much promise but oh well with the lasting power :-/ i like a duo like that, 2 in 1, but not if it doesn't work well! I was bummed out about this duo's lasting abilities :( But it is a nice color, though. Gonna come in handy for the coming fall/winter.